11:30 a.m. and the smoke is really bad. UCSD will be closed for a third day tomorrow. The campus had never been closed before the 2003 fire disaster, and now a second multi-day closure within a four year period. And the 4th anniversary of those fires is precisely this week. The good news is that the wind has died down. The bad news is that the wind has died down. That’s not fog. That’s smoke. Bad day if you need to breathe. With winds blowing up till very early morning, it was warm overnight. It was 72 at midnight, and the humidity was only 11%. As the winds calmed down, the temperature dropped, but the humidity was still only 25% at its highest. Temp dropped only to 63 up the hill, but all the way to 55 down below. ((Amazingly, NWS reports that several areas to our east and southeast had temperatures around 80 at 7:00 a.m.!)) That temperature range shows the impact of slope, calmness, and dryness that normally (i.e. other than the freeze of January, 2007) means no freeze up above despite winter chill down below. I do not think we are out of fire danger yet, but the risk has lessened a lot. The most active part of the fire at Fallbrook is the northwest side, where there is a lot of open land. Apparently there remains some theat to downtown Fallbrook from this fire. Major threats remain to populated areas farther south, even all the way to the coast. The region remains under a red-flag warning, which has been extended until Wednesday afternoon. Winds forecast to pick up again briefly, temperatures could approach 100 today (though the smoke clouds could prevent that much heating) and very low humidity will persist. 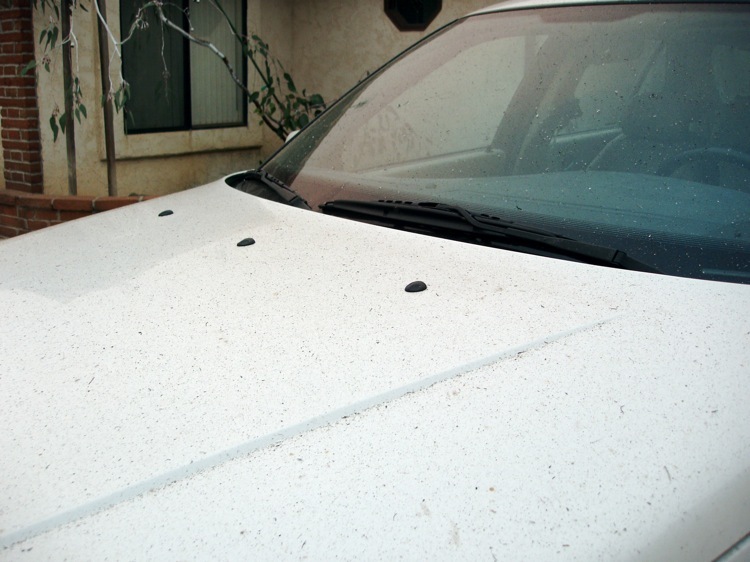 Ash-dusted car this morning (all packed and ready to take us away). 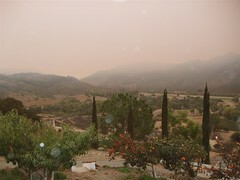 The view to the west/northwest at about 3:30 yesterday afternoon: smoke from the fire near Fallbrook. View yesterday at about 5:20, looking east/southeast from just outside the house. 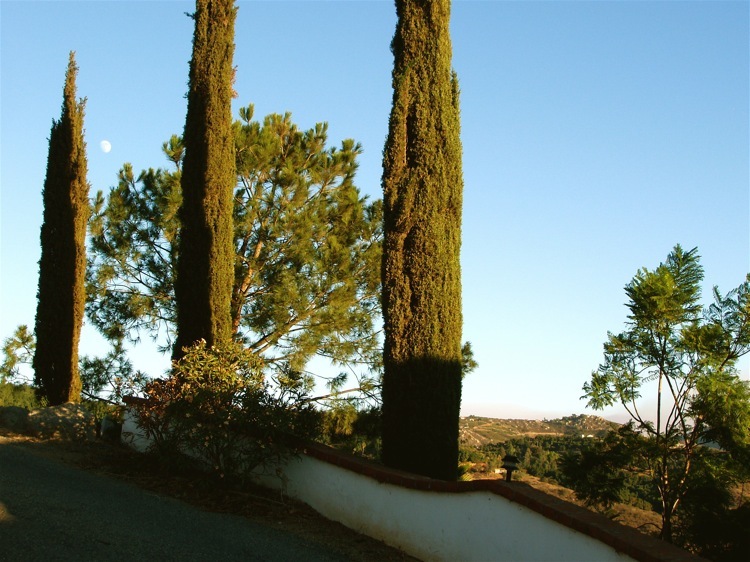 Smoke is visible above the ridges in the right of the photo, but it is very clear here, with the moon visible in a perfectly blue sky. This is the view to the southeast from the finca at around 6:30 this morning, right before sunrise. For now, the finca should be safe. The winds are blowing out of the northeast, so the danger areas are south and southwest of us. But there are reports of other, smaller fires to our northeast. Overnight humidity got only as high as 21% here, and it was as low as 6% yesterday afternoon. Expected to be lower today. And hotter both today and tomorrow–could reach 100 tomorrow. Ridiculous for October. And very dangerous. This is too much like 2003 again. Very worrisome. Large areas of the northern San Diego suburbs are being evacuated. Any of my students reading this who have not seen the intranet announcement: No class today. Update (10:53 a.m.): Still OK here at Ladera Frutal, but getting essential items together, just in case. The humidity is down to 7% and falling. 84 degrees. No wind here now, which is good. Reports indicate high winds elsewhere in the region. County emergency officials say this is much worse than the Cedar Fire of 2003. Hard to imagine. 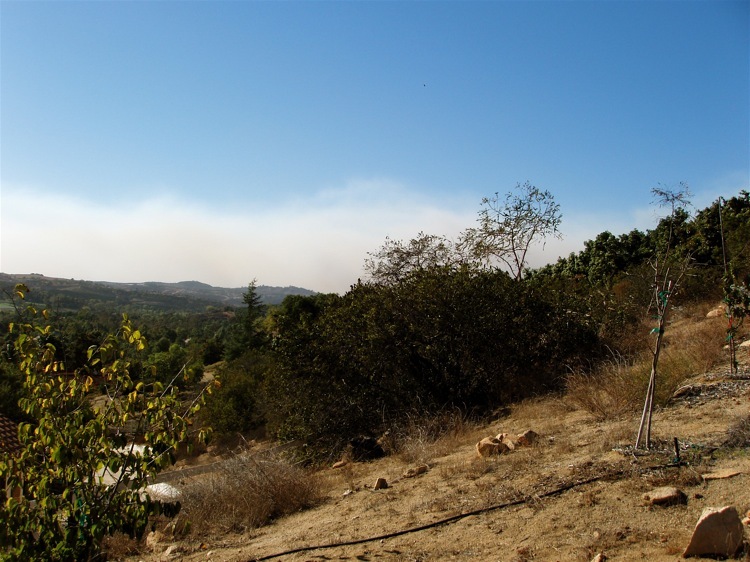 They also say the fire currently burning from east of Ramona west to Rancho Santa Fe is highly likely to reach the coast before it burns out. That would sever the transportation links between here and the city. UCSD has canceled classes for Tuesday. Update (3:44 p.m.): Now, apparently all of Fallbrook is being evacuated. That is only a few miles north, but we are currently out of the wind-driven path of the smoke (and thus the fire). No advisories have been issued here. 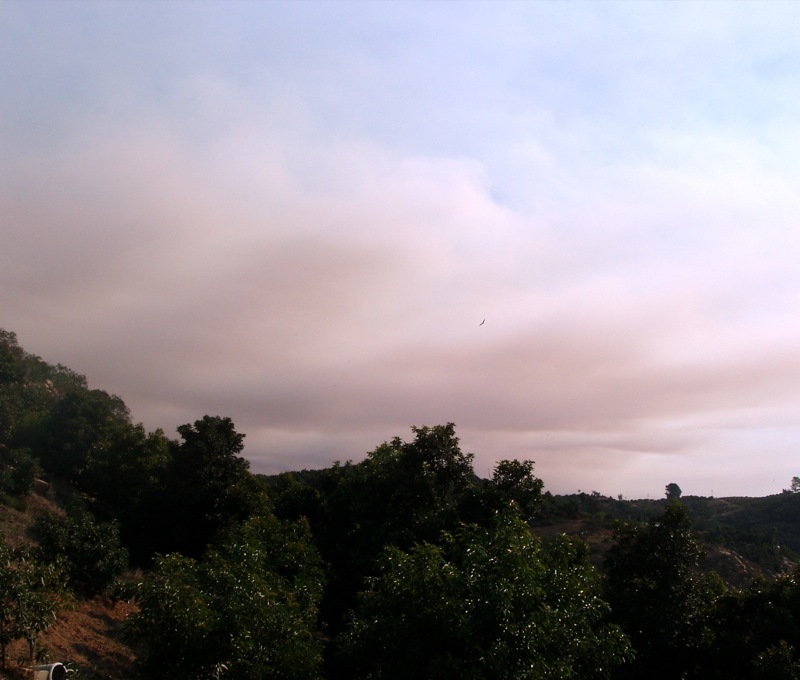 I can see smoke to the northwest (from the fire in eastern Fallbrook, the location of which is more or less due north.) The wind has been up above 20 MPH, still far less than elsewhere, but threatening some trees and fruit. Still pure blue sky in our immediate area and about 85 degrees and humidity marginally up (6%). Ready to go, if necessary, but nothing imminent. Looks like a sleepless night or two ahead. This morning marked the third day in a row that we felt and/or heard an earthquake here at Ladera Frutal. All pretty small (M 3.4 to 4.7 ((There is also a 3.1 in that list, but I do not recall noticing it; it was also the farthest away of these four.)) ), but all sufficient to get one’s attention. A bit farther south, if you compare the archive of Hurricane Henrietta‘s locations with the earthquake epicenter reports, you see that the southern tip of Baja received a 5.0 jolt just as it was being raked by hurricane winds. Meanwhile, recent hurricane convergences are record-setters. Today is only the second time on record ((Apparently, Pacific records are only since 1949, though the Atlantic record referred to in this entry covers a 130-year period.)) that the Americas are receiving a hurricane on both the Atlantic and Pacific coasts in the same 24-hour period. The one on the other side, is, of course, far bigger. Felix is now a tropical depression, dumping rain on Central America, but came ashore as a Category 5. This is the first time two Category 5 storms have hit the Caribbean region in the same season, following Dean just over two weeks ago. Felix has already broken an “unofficial record” as the “most explosive” hurricane ever in the Atlantic basin, surpassing Wilma, in October, 2005. Update: That first link will always show the most recent earthquakes in the area, so those referred to above will fall off the page after a bit. However, a check today–9 Sept.–shows yet another 4.0 off the northern San Diego County coast last night. (There was also a 3.7 off La Jolla this morning). This last couple of weeks has represented the greatest flurry of (small) earthquake activity I can remember in the area in quite some time. This fire did not burn for long, and only briefly threatened a few homes a short distance away from the finca. But it is never a pleasant sight. Or smell. As can be seen in the photo, the smoke began to settle in the canyon. It still could be smelled later that evening, even though the fire was almost fully out by 1:00 p.m. This canyon is an almost perfect “smoke sink.” When we had those catastrophic fires all around San Diego County in October, 2003, the day the winds died down, the smoke was like a dense fog in the canyon. This was nothing like October, 2003, fortunately. (See NASA’s striking photo of those fires.) And this fire was farther away than the small fire directly across the canyon in February, 2006. This is fire country. Keep that brush cut. Obviously, we have a pretty nice climate here overall. Just look at all the fruit we can grow. But there are two really big drawbacks of this climate. One is periods of depressing gloom and fog. The other is the frightening fire-weather season. We have had both in the past week. Wednesday was a day of dense fog that took a long time to clear–common in spring and early summer, but really unusual in late October. 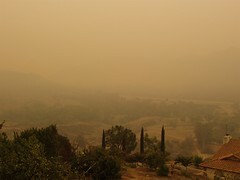 The above photo shows our the view to the northeast, over our avocado grove, last Thursday at around 11:00 a.m.
Then the winds died down–here, at least–and the smoke settled in. The second photo is of the setting sun. Yes, that is the sun. This week is exactly three years since the horrific firestorms that gripped San Diego County. 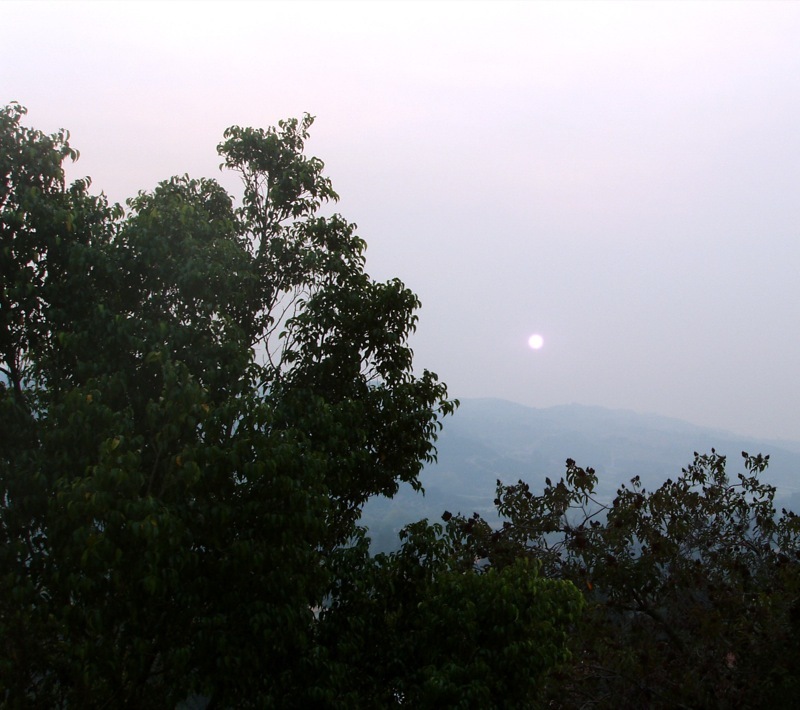 When the winds died down for a couple of days while those fires were burning, the smoke was so bad here in Moosa Canyon that it was like a dense ground fog, only one that left eyes and lungs hurting. Last Thursday was the worst I have seen since then, and I could still smell a little smoke today, but obviously this has not been even close to that awful week in 2003.